Mention “NaNoWriMo” to a fellow writer and you’ll get one of two responses. They might just stare at you with raised eyebrows, wondering if your tongue tripped on its way out of bed that morning. More likely, however, their eyes will light up. NaNoWriMo–or National Novel Writing Month–has become the writer’s equivalent of the playoffs. It’s the writing event, participated in worldwide, as authors make the commitment to write 50,000 words during November, one of the busiest months of the year. Indeed, thanks to my discussions with thousands of writers who have already enthusiastically tackled and conquered NaNoWriMo, what I’ve realized is that NaNo’s greatest benefit isn’t the obvious one–the 50,000 written words in your Word or Scrivener doc. Rather, the greatest benefits of NaNoWriMo are the excellent life habits it inculcates in writers. After all, one month of productivity and half a novel really isn’t worth that much in the long run. Instead, the invaluable takeaway from this headlong month of productivity is the head start it gives you on the rest of the year. This month, for the first time ever (because I’ve only been meaning to do this for the last bazillion years), I’m going to put together a series of posts to help you prep for your best (even if it’s your first!) NaNoWriMo ever. In future posts, we’re going to talk about the nitty-gritty of preparing your notes and putting together a game plan for shutting off your inner editor and ramping up your motivation and commitment. Today we’re going to start with an overall focus on the skills you should be concentrating on this November. For your NaNo series…How about a post about how you can translate NaNo’s principles into spurring you into being a more productive writer? Essentially, that’s what we’re answering today, but with a focus on consistency rather than momentum. As valuable as momentum is, it’s overrated. Consistency is what counts. If you can learn how to practice your good NaNo skills every single day of the year, you’re going to be one unstoppable writer this 2016! And even if–like me–you won’t be participating in NaNo, you should still be figuring out ways to increase your proficiency in all of these areas. This one is probably my favorite. In writerspeak, what’s the translation for “preparation”? You know it! Outlining, baby, outlining. And as most of you know, I’m a huge proponent of outlining any month of the year. Whether you find full-bore outlining, such as I encourage in my books Outlining Your Novel and the Outlining Your Novel Workbook, to be the most helpful approach for you or not, if NaNo teaches writers nothing else, it offers the perfect illustration of how prep work smooths the way for us during the first draft. Can you write 50,000 words in thirty days without an outline or any prep? Sure. But as many a NaNo-er can attest, they’re much less likely to be good words if you haven’t put in the necessary time and forethought upfront. Use the month of October to research and brainstorm your story, so you’re ready to roll come November. Then put those outlining skills to good use in racking up the word counts into December and beyond. More on prepping for NaNo next week! This is absolutely true during NaNoWriMo, as attested by authors shouting thank-yous to spouses for takeaway Chinese dinners and help with laundry. But guess what? It’s just as true all year ’round. Don’t get me wrong. 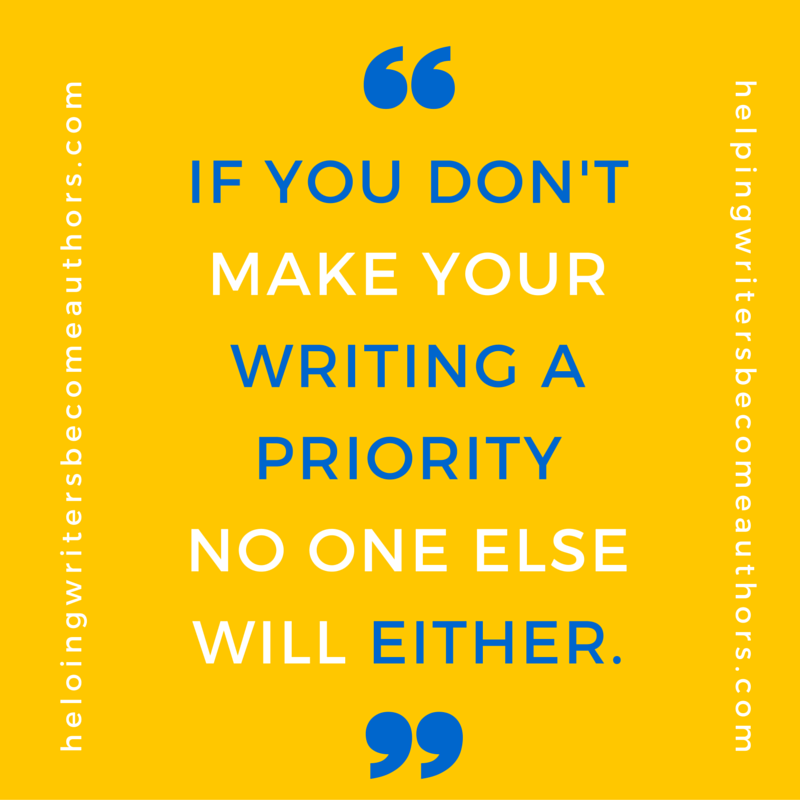 Making writing a priority isn’t easy. In the hustle-bustle, distraction-ridden modern lifestyle, making writing a priority can be downright painful at first. So take that iron will you’re imposing on yourself (and your loved ones, when necessary) during NaNo and keep flexing it every single day for the rest of… well, forever! NaNo forces writers to be consistent on a daily basis, because that consistency is the only way to meet the possible-but-definitely-steep goal of 50,000 words in a single month. Don’t lose that consistency just because the pressure of a difficult goal has been lifted from your shoulders. Resolve to keep it up every day, and your yearly productivity will far outstrip even what you’re able to accomplish during NaNo. Personally, I have a love/hate relationship with word-count goals. As I detail in this post, sometimes word-count goals can actually end up being counterproductive. But NaNo proves, in spades, that sometimes a solid word-count goal can revolutionize your writing process and your daily productivity. Lately, in an effort to maximize my own daily productivity, I’ve been implementing the strict but totally doable word count goal of 300 words per fifteen minutes. That’s 1,200 words per hour. Keep that up throughout November and you’ll need less than ninety minutes every day to reach that 50,000-word mark by the end of the month. Three hundred words every fifteen minutes is 100% feasible. You have to keep typing, of course, but that’s kind of the whole point. Keep moving forward, trust your instincts, trust your ability to revise (I recommend revising each day’s work at the beginning of the next day’s session–and, yes, even during the mad rush of NaNo). Writers often view NaNo as an extended sprint: achievable, but not a pace you can keep up all year ’round. Baloney! Most writers can totally keep up this level of consistent productivity all year around. Find a pace that works for you and keep at it, even after you’ve reached that 50,000 word mark. The founding principle of NaNoWriMo is productivity via forward progress. One of the most valuable byproducts of this is the necessity of turning off your inner critic. Let me tell you something: It is impossible to write 50,000 words in thirty days if your infernal internal editor is sitting on your shoulder the entire time. We’re going to discuss this more in a future post, but for now suffice it that the habits you learn during November–chief among them the ability to write quickly, as per above–are going to serve you well in the long run. Once you get into the groove where you’re writing along and shutting out your internal editor’s carping, pay attention to that feeling. That’s something you definitely want to carry with you in future months. Don’t lose that. Take the friends you’ve made during NaNo and share the writing life with them all year long. And even if you’re not participating in NaNo (and therefore, we can assume, friendless–kidding, kidding! ), take this as a spur to get yourself out there into Social Media Land and meet some fellow authors with whom to share the blessings and burdens of the writing life. Finally, and perhaps most importantly, NaNoWriMo provides you the opportunity to learn that most important of all writing skills: finishing books. Even if you aren’t finished with your book after 50,000 words, you’re not going to quit, right? Thanks to the siren call of shiny new story ideas, the discouragement that often comes with the long haul of writing an entire novel, and just the general distractions of life–learning how to finish novels can be an uphill battle. And, yes, it is a learned skill. It’s a habit we must inculcate. Once you do get into the habit of finishing books, you will have the benefit of a proven track record to look back on whenever discouragement or distraction hits you afresh. You finished before, you can finish again! Even better, a finished book is a book you can share–with agents, editors, and readers. That’s definitely a habit worth enforcing the entire year through. If you feel like you may be struggling with any of these important habits in your writing life, then NaNoWriMo is a tremendous opportunity to up the stakes and learn how to put them into practice in your life. Remember: This isn’t about having an awesome November. 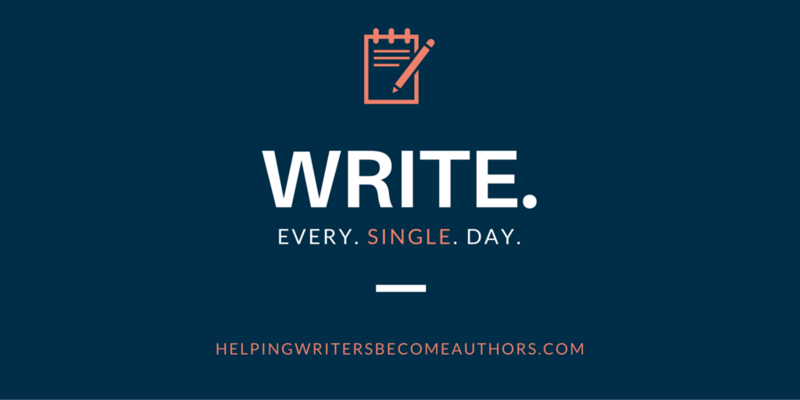 This is about having an awesome rest of your writing life! Wordplayers, tell me your opinion! 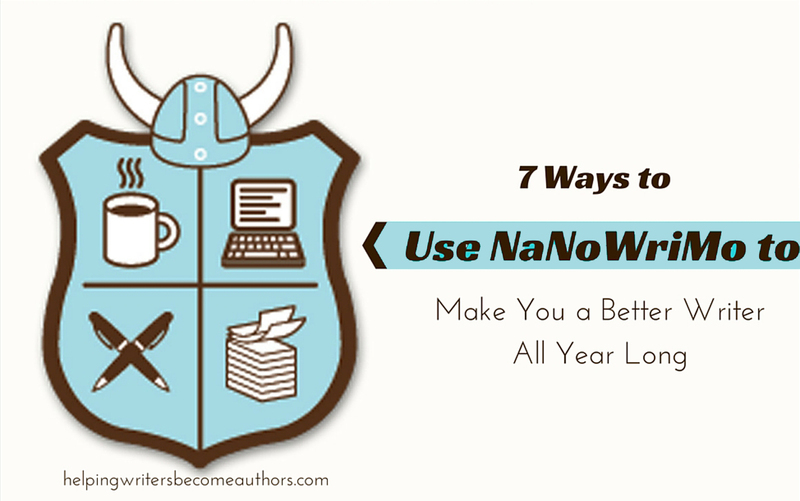 Will you be participating in NaNoWriMo this year? Why or why not? Tell me in the comments! I am going to do it this year, and one big plus I see is that LOTS of friends — not just those who are serious about writing all the time — will be participating. All the more support to keep me in line! Ah, that’s fun! The more, the merrier. I am leaning hard in the direction of “DO IT!”. Not entirely sure about a huge family trip out of state for T-Giving, plans seemed stymied right now so as soon as I know the status of that, I can commit. I work as a professional fine artist, too, and from now through 2nd wk of Dec is heavy traffic for me, so it would mean a loss of income to do NaNo. 🙁 I won’t commit to it unless I’m dead certain I have the space to complete the goals, so jury’s still out but not for much longer…..I’ve been intrigued by this project since I first learned of it two years ago. Agreed with everything you said. And thank you. I hope good results are awaiting for all of us! After finishing my first novel, I was in cloud nine, so proud of myself and amazed at my own skills. I thought finishing a novel was an impossible task for me before and I felt depressed every time I walked into a bookstore, for certainly I was no real writer if I couldn´t get myself to finish a novel as I wanted to. But one day I did. And I was happy. Very much so. Then the moment came when the book was launched and… oops. Suddenly I had to face the challenge of writing a second novel. I smiled at the idea full of myself. I did it once, certainly I could do it again in the blink of an eye. So I started trying. The first idea didn´t work, it was a sort of literary/philosophical piece I decided I was too young to try. Moved to the next idea. Surprise, it didn’t work either. I started pondering a third option. And I started thinking I was a failure after all… it was all luck, I was useless to try it again. Then I attended a book launching where I found one of my fellow writers here. He urged me to finish a short novel for a contest where I could win some money and publication. Fair enough. He gave me forty days to deliver the finished product. You didn´t misread, FORTY DAYS, and I didn´t have a single word written. So I sighed and crossed my arms with reluctance, but in the end I accepted the challenge and promised to deliver something. He insisted I had a lot of time and that I just needed to pick up an old idea. I tried to turn a short story into a novel, but decided the same day it wouldn´t work. So I changed, and I picked up again that idea from two years ago, the one I once thought myself too young to write. I started, forcing my inner editor to stay in the back of my mind. I just typed (I reached 1000 words a day on work days and 2000 on free days. I admit I took a week off work for this). Four days later my beloved granda passed away. Two days after that it was my dearest uncle. And I found out my aunt who lived in Germany was gone too. My father wasn’t in the country and he cut communication for a full week, his own way to face pain (it was all his family). It was hard, and I cried a lot, but every single day I came back to my desk and wrote. The world didn´t stop because of my pain. I had a top of 200 pages. I decided I wanted a 30.000 words long story. I finished with 22.000 in two weeks and started the editing. I added substance and description, action beats and details. By the night I needed to print and deliver the thing, I had 31.000 words and I had had the chance to revise it five times. I filled 92 pages with very narrow margins. My fingers are still crossed I will win that award, I guess I´ll be knowing in a few days, but at least this allowed me to discover I wasn’t as useless as I thought even if I´m not the chosen one. All I needed was to sit down and do it. I don´t know if I´ll be able to pull this off twice in a year, but I´m definitely gearing up for NaNoWriMo, all this October to keep up my research and outlining (I am very much of an putliner). So, that is my experience. Don´t tell yourself you can´t. Sit down and do it! This is an amazing story! Thank you so much for sharing it. Despite (because?) of how hard writing is, it’s the best catharsis I know. I bet it helped you work through your difficult time as well. I hope it helps someone 😀 Sometimes we are not as alone as we think, as you pointed here. I will say it helped, yes. And I agree with you it´s a great catharsis! Sounds like a sign! I hope this year’s NaNo is a great experience for you. Just remember to carry it forward into the next year! I signed up for NaNoWriMo for the first time. Five years (!!!) I’ve been thinking about writing, reading about writing, but have never actually done any writing. I guess I am my own worst enemy in that aspect. Chances are I’ll probaby pen what will become The Worst Story Ever Written (which is no small feat in itself 🙂 ), but it doesn’t matter. Getting actual words on paper, that will form some sort of story is my main goal. After five years, it’s about time. So that’s my NaNoWriMo goal. That’s awesome to hear! Don’t worry to much about the quality of your work at this point. The first step is always just getting words onto paper. You can’t polish words that aren’t written, and you can’t finish a story you never start. I did NaNo for the first time last year and LOVED it! It was just what I needed (deadlines and positive peer pressure) to get the first draft of my novel out. Almost a year later it’s been through beta readers and a professional editor, and I’m on the 5th draft. I wish I could do NaNo this year, but I don’t think I have 50,000 words of new material in me for this novel. However, I do have an idea for a prequel, so I’m thinking I’ll be an every-other-year NaNo-er. Good luck to everyone doing it this year. It’s totally worth it!!! There definitely should be no pressure to do NaNo every year. Do it when it works for you. Do it when you feel it has something to offer you. And that’s totally awesome about your previous success! Hey KMWeiland, I have a question, if you have the time. I love to write (even if I’m not that good at it), but I am only 13 years old. I feel like this limits me as to how far I can take my writing. Do you think I should still participate in NaNoWriMo? (And do you have any advice for your authors?) Any help would be great! Believe me, at thirteen, the sky’s the limit! You have nowhere but up to go from here and all the time in the world to do it in. I started writing when I was twelve. Honestly, I wouldn’t worry at all about limits. Write what you love and because you love it, and definitely enter NaNo if you’re interested. Age shouldn’t be a factor at all. Good luck! You go! Best of luck. I have recently signed up for my first Nanowrimo. While I was excited about this undertaking when I officially signed-up, I feel even more inspired after reading this post. #6 from this list is the item that has me most excited about Nanowrimo. I’ve already signed up for a couple of local meet-ups and I’m really looking forward to meeting and connecting with local writers. Yes for the year of 2019, I’m going to put it into practice just like it’s November.